As a youngster I used to hate practicing with a metronome with until my piano teacher, Joe Palin, introduced me to a practice technique he employed that I’d like to share with you. 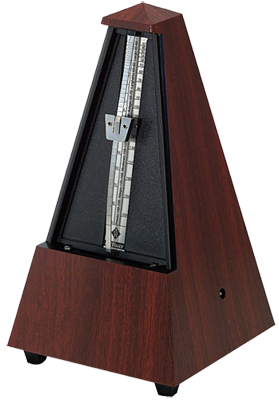 By setting the metronome at half the speed needed and then hearing the clicks as the 2 + 4 of a 4/4 time signature you can actually get the metronome to swing! It works great with anything in 4/4 time, from scales to hanon exercises, improvising through chord changes to a Bach fugue, try it! Just watch out for kittens that think a metronome is a plaything!